The buzzer goes off, signaling the end of yet another volleyball game for the high school, and a landslide victory over Annie Wright. Senior Mia Knight gathers with her teammates, celebrating three well-played sets. Knight has been playing volleyball since eighth grade. She was moved up to the varsity team as a freshman and continued to rise in the sport. For the past three years, Knight has been the team’s libero — a position that can substitute for another player at any time. She also plays a key defensive role during games, keeping the ball in play and properly preparing the rest of the team to perform against an aggressive and coordinated offense. The position brings its share of challenges. Knight has to be court-aware, quick on her feet, and a good passer. As a freshman, Knight acquired these skills from then-team libero Maddie Gateman. During the off-season, Knight stays active by participating in other sports, including club softball and cheer. This strong sense of determination and work ethic has made Knight an essential player on the team. 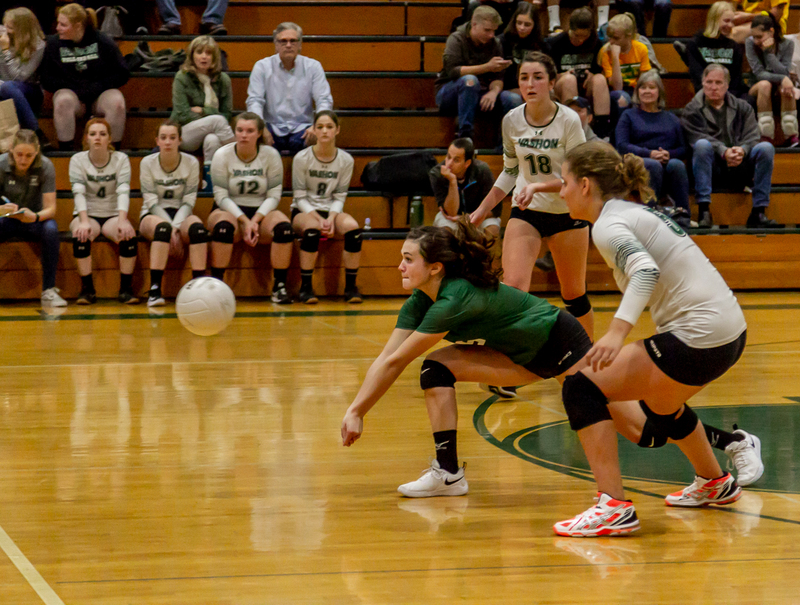 Being a libero requires more than just a mastery of basic volleyball skills, though. They need to bring energy to the team, keeping spirits high through the more difficult moments of a match. Knight rises to this challenge. “Mia has the most upbeat and positive attitude on the team,” said teammate senior Anna Olson. Their recent success has given the volleyball team a strong standing within their league; their five-game winning streak making up for the recent losses. If the volleyball team continues to perform well, they may have a chance at reaching the state tournaments. Sears is cautiously optimistic about the prospect, noting that no VHS volleyball team has gone that far. “There have been a few years where I thought it was a possibility, and this would be one of those years,” Sears said. Despite the favorable prospects for the end of the season, Knight doesn’t play for the glory. Rather, she enjoys volleyball for the sense of community it brings.